My dad is about 2 years old in this photo. 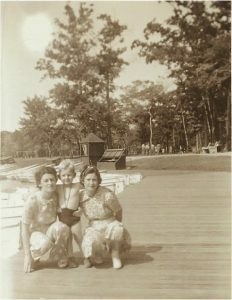 My dad’s mother had three sisters. Two of them are in this photo. Aunt Rose (on the left) is my Godmother. Aunt Bess is on the right. Bess’s granddaughter Amy (who goes by Emunah) uncovered a box of old photos and letters from my Dad, spanning almost 30 years. He began writing them in 1968, soon after we moved to South Florida, and continued until his death in 1997. My aunts loved my dad, and it’s pretty clear from the letters that he loved his aunts.